On November 7, 1938, a Jewish teenager, Herschel Grynszpan, fatally shot a German diplomat in Paris. Within three days anti-Jewish violence erupted throughout Germany, initially incited by local Nazi officials, and ultimately sanctioned by the decisions of Hitler and Goebbels at the pinnacle of the Third Reich. As synagogues burned and Jews were beaten in the streets, police stood aside. Men, women, and children—many neighbors of the victims—participated enthusiastically in acts of violence, rituals of humiliation, and looting. By the night of November 10, a nationwide antisemitic pogrom had inflicted massive destruction on synagogues, Jewish schools, and Jewish-owned businesses. During and after this spasm of violence and plunder, 30,000 Jewish men were rounded up and sent to concentration camps, where hundreds would perish in the following months. “Kristallnacht” revealed to the world the intent and extent of Nazi Judeophobia. However, it was seen essentially as the work of the Nazi leadership. Now, Alan Steinweis counters that view in his vision of Kristallnacht as a veritable pogrom—a popular cathartic convulsion of antisemitic violence that was manipulated from above but executed from below by large numbers of ordinary Germans rioting in the streets, heckling and taunting Jews, cheering Stormtroopers’ hostility, and looting Jewish property on a massive scale. 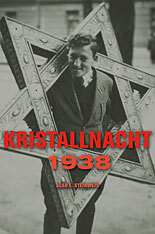 Based on original research in the trials of the pogrom’s perpetrators and the testimonies of its Jewish survivors, Steinweis brings to light the evidence of mob action by all sectors of the civilian population. Kristallnacht 1938 reveals the true depth and nature of popular antisemitism in Nazi Germany on the eve of the Holocaust.